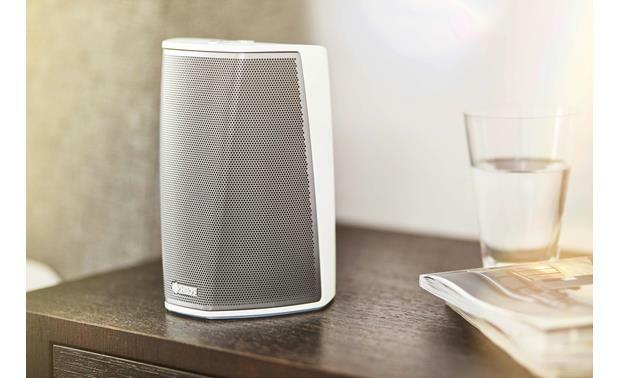 Crutchfield customers raved about the convenience of Denon's original HEOS 1 speaker. 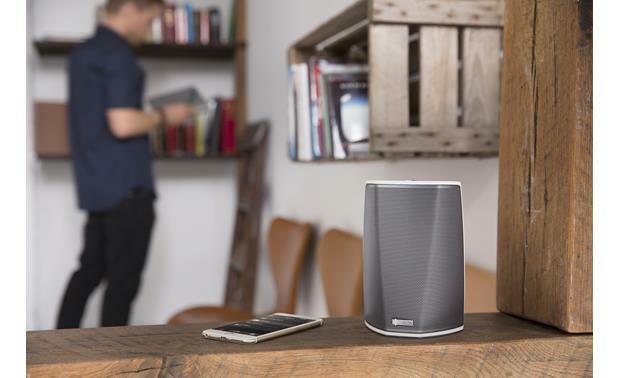 The Denon HEOS 1 HS2 (pictured in black) has a space-friendly, humidity-resistant design. If you add Denon's optional Go Pack, the HEOS 1 becomes even more flexible. The Go Pack is a handy rechargeable battery pack that can power the speaker for six hours. 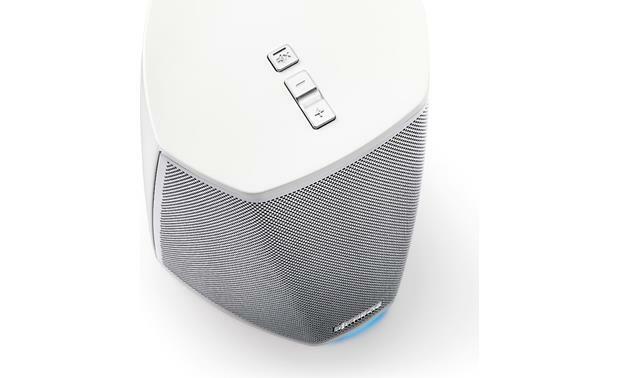 It covers up the HEOS 1's inputs, transforming the speaker into a portable, splash-proof bundle you can enjoy outside. One reason people loved the first generation of HEOS was because setup was fast and easy. Denon hasn't changed that a bit with their latest series. 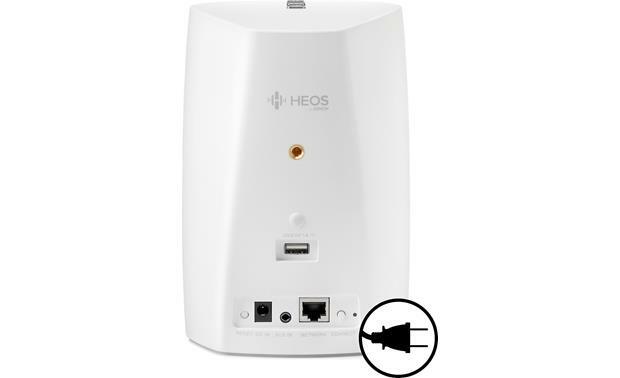 First download the free HEOS app for your smartphone or tablet, then connect your device to the HEOS 1 using the special setup cable. With a few taps of the app, your Wi-Fi settings are automatically transferred. When you unplug the cable, you'll have full wireless control of the speaker. Repeat the same quick process to add other HEOS speakers, and you can control them all with the same app. 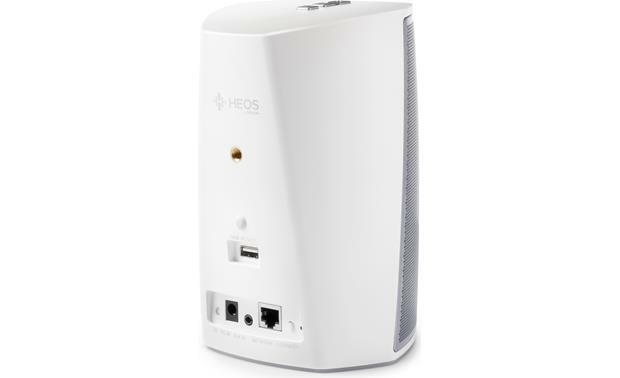 The HEOS smartphone app makes it easy to set up and play the HEOS 1 (pictured in white). The HEOS app lets you choose one song for the HEOS 1, and something completely different for, say, a HEOS 3 speaker in a bedroom, or a HEOS HomeCinema sound bar in the living room. Or you can group HEOS speakers together and have the same tunes playing throughout several rooms. Have first-generation HEOS gear? All HEOS components are compatible, so you can mix and match. I could not be happier with this speaker. Perform well as a stereo pair in the bedroom. They look good too. They perform well with Alexa. Easy setup! So pleased that I ordered another one for another room! Will these Heos speakers work as rear or back surround speakers in a 5.1 or 7.2 surround set up with a compatible Denon home theater receiver? I have not used the speakers in this manner, so I'm really not in a position to answer the question. Note: A Group refers to the HEOS App's ability to take multiple HEOS systems and play them together, so you're outputting the same source information from all the HEOS systems at the same time. Grouping the systems will also allow proper synchronization to all systems so you should never hear an audio delay between the HEOS systems. Can the Denon Heos 1 or Sonos 1 work with our Samsung 75" Qled TV ? As a supporting speaker that I can place close to my seat to help this Old Man to hear TV without blowing the wife out of room with our 5.1 sys? 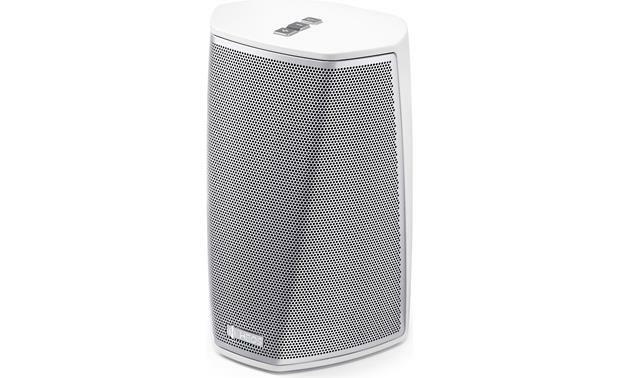 Plus how do these 2 speakers differ in use ? Hey Ol'pal. Crutchfield asked me to help so I will give it a try. You have a beautiful TV. I know because I have the Qled 65". This TV does not connect to Sonos. I tried. I use a Samsung sound bar for my sound. However, I understand your question. you want a centralized sound for the Ole Timer and don't want to blow everyone else out. I am not sure how you find that solution. I can tell you this though my Sonos 1 & 5 are perfect for listening to my "Bruce Springsteen" concerts. Good luck with your issue. Also, if you gopogle this issue there is a community for Sonos that can confirm what I just said. You have to have the sonos sound bar in order for any of the sonos speakers to synch up with your tv. I would highly recommend the sound bar, the sub woofer and two sonos play 1's or play 3's fpr rear speakers if you can afford it. I have this setup on two tvs in my home and we love it! will this work with my Bose sound touch wifi system? 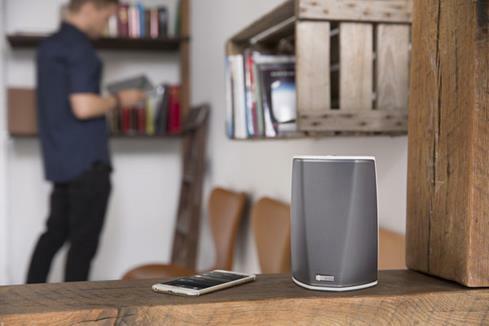 The HEOS 1 is part of the Denon HEOS wireless multi-room audio system. The HEOS line comprises of network music amplifiers, pre-amplifiers, and speakers for your whole home. The HEOS 1 can pair up with other HEOS components, but it wouldn't be able to work with your Bose SoundTouch system. If you would like to discuss further, feel free to contact an Advisor directly by phone (1-800-324-9695) or online chat. I hope that helps! I don't have for surround speaker but use as a single speaker for Bluetooth. Sounds amazing for one little speaker! These work as rear surrounds with the Heos Bar which to me also functions as a Denon receiver. The Heos Bar has front left, center, and front right channels. 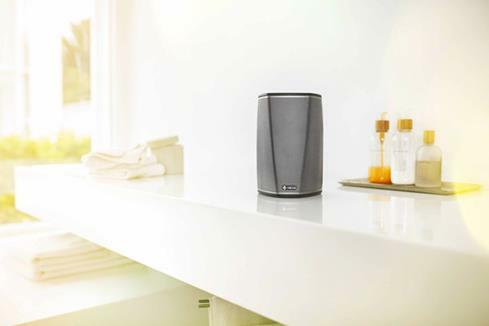 Searches related to the Denon HEOS 1 Compact wireless powered speaker with Wi-Fi® and Bluetooth®.